Oshkosh, WI 54904 CESA 6 Conference Ctr-Connections 10/23/2018 09:00 AM - 03:00 PM _Q&A 2:30 - 3:00 P.M.
Oshkosh, WI 54904 CESA 6 Conference Ctr-Connections 1/29/2019 09:00 AM - 03:00 PM _Q&A 2:30 - 3:00 P.M.
Oshkosh, WI 54904 CESA 6 Conference Ctr-Innovations 4/4/2019 09:00 AM - 03:00 PM _Q&A 2:30 - 3:00 P.M.
Fountas and Pinnell developed an indispensable instructional tool to support all teachers in their work with readers. This workshop series will dissect this tool so teachers may: 1) develop a theory of the reading process; 2) acquire a detailed lens for assessing students; and, 3) plan and deliver responsive lessons that will propel readers forward. What are the strategic actions? How do readers combine different strategic actions into a system to create personal meaning? What are the ten characteristics of any text? How do the ten characteristics differ across text levels? 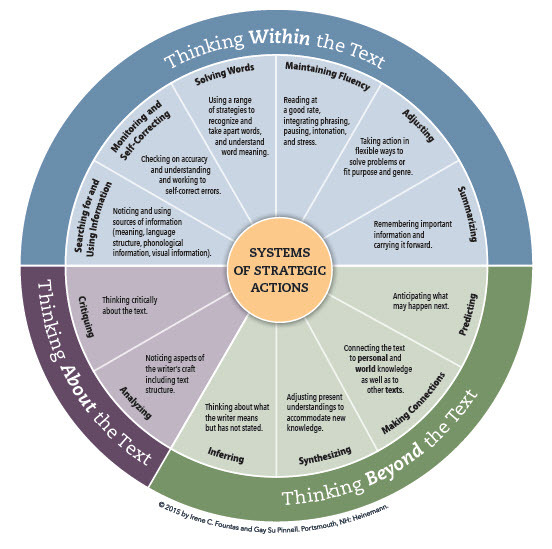 How do I use miscue analysis to develop an understanding of readers’ systems of strategic action? Using a reader’s writing-about-reading samples to inventory their word solving systems. Matching texts to readers to support strengthening a reader’s word solving system. Pre-reading strategies to support effective word solving during reading. Prompting during reading to support effective word solving. Using miscue analysis to assess a reader’s thinking within the text. Using a comprehension conversation to assess a reader’s thinking beyond the text. Conferring with readers to strengthen and expand systems of strategic action – Individual Conferences, Small Group Conferences. Student-led book discussions after reading to strengthen and expand systems of strategic action. Teachers of struggling readers in grades 5 – 12. Includes access to online materials and resources and lunch for all sessions.